According to the Skin Cancer Foundation, more people are diagnosed with skin cancer each year in the U.S. than all other cancers combined. While the myriad of sunscreen selections on the market has increased, so have rates of melanoma — the deadliest type of skin cancer. Without adequate protection, the risk of DNA damage caused by sunburn and the two most common forms of skin cancer, basal cell carcinoma, and squamous cell carcinoma, escalate. The good news is, it’s never too late to start protecting yourself. Sun damage is cumulative, and contrary to what you may have heard, only 23 percent of lifetime sun exposure occurs by age 18. 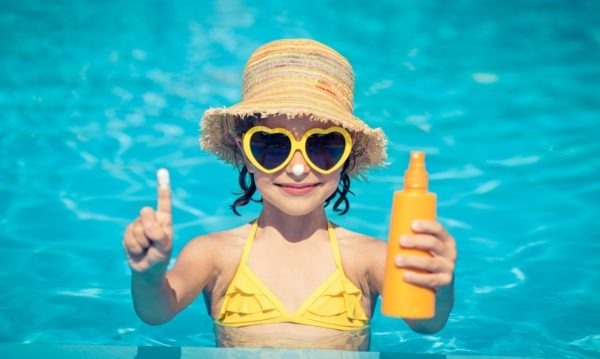 The bad news is, it’s not just solar protection we need, it’s protection from the array of dangerous chemicals found most name-brand sunscreens. Here are some basic do’s and don’ts when it comes to reading sunscreen ingredient labels and knowing what to choose — and what to lose. Zinc oxide: Offers broad spectrum, but this mineral can have a chalky, white texture. Look for non-nano zinc oxide. Mexoryl SX: Offers UVA protection. Titanium dioxide: Avoid nanoparticle or powder and spray versions of this mineral (should not be inhaled). Broad spectrum, but not as effective as zinc oxide for UVA protection. SPF 30: The minimum level of protection factor recommended by the American Academy of Dermatology. Broad spectrum: To assure both UVA and UVB protection. Nano-particles: Molecular-sized nanoparticles enhance the penetration of active ingredients, but could cross over into the bloodstream, potentially causing systemic toxicity. Avoid loose powder or spray sunscreens using titanium dioxide or zinc oxide of any particle size. Oxybenzone: The Centers for Disease Control and Prevention routinely detects oxybenzone in more than 96 percent of the American population. The chemical can cause allergic skin reactions, and studies suggest that it disrupts hormones in children and adults. In May 2018, Hawaiian lawmakers passed a bill banning oxybenzone in all sunscreens due to its role in coral bleaching and coral death. The bill awaits the governor’s signature before it becomes law. Retinyl palmitate (vitamin A): A National Toxicology Program study reveals that retinyl palmitate enhances skin cancer lesions in the presence of sunlight in animal research. Octinoxate: This common sunscreen ingredient is shown to have hormone-mimicking effects on laboratory animals. Parabens: Synthetic preservative — methylparaben, ethylparaben, propylparaben, etc. are endocrine disruptors. Phthalates: Synthetic plasticizer, EDC. 75 percent of products with the ingredient “fragrance” contain phthalates. Petrochemicals: including mineral oil, petrolatum, and petroleum jelly. Skin irritation and contamination. Synthetic fragrance: Hundreds of toxic chemicals can be hidden in the ingredient “fragrance.” Studies show 95 percent of the chemicals used in fragrances are derived from petroleum. Synthetic colors: Synthetic colors can be derived from coal tar (i.e., Yellow #5, Blue #1 and Red #40). Insect repellent: Can cause adverse health effects. So, before your next outdoor outing make sure you protect yourself and the environment and select the best sunscreen!